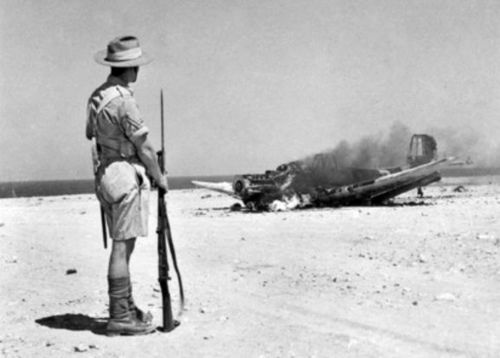 The Second Battle of El Alamein began on 23 October 1942, and ended 12 days later with one of the first large-scale, decisive Allied land victories of the war. It was a decisive turning point in history. "Now this is not the end; it is not even the beginning of the end." “I have cancelled the plan for withdrawal. If we are attacked, then there will be no retreat. If we cannot stay here alive, then we will stay here dead.” General Bernard Montgomery, exclaimed. The Battle of El Alamein was primarily fought between two of the outstanding commanders of World War Two, Montgomery, who succeeded the dismissed Auchinleck, and Rommel. After Dunkirk and successive defeats in resisting Hitler across Europe and Africa, by 1942 Allied morale was at a very low point. The Allied victory at El Alamein led to the retreat of the Afrika Korps and the German surrender in North Africa in May 1943. From this point onwards, history was changed. What seemed like the end of democracy and freedom was turned into a decisive fight-back with the confidence and expectation that Hitler could be defeated. Montgomery, a master planner, correctly predicted both the length of the battle and the number of casualties (13,500). Soon after Allied armoured units and infantry broke through the German and Italian lines and were pursuing the enemy forces at speed along the coast road, a violent rainstorm burst over the region, bogging down the tanks and support trucks in the desert mud. Montgomery, standing before his officers at headquarters and close to tears, announced that he was forced to call off the pursuit. Historian Corelli Barnett has pointed out that the rain also fell on the Germans, and that the weather is therefore an inadequate explanation for the failure to exploit the breakthrough, but nevertheless the Battle of El Alamein had been a great success. Over 30,000 prisoners of war were taken, including the German second-in-command, General von Thoma, as well as eight other general officers. Rommel, having been in a hospital in Germany at the start of the battle, was forced to return on 25 October 1942 after Stumme – his replacement as German commander – died of a heart attack in the early hours of the battle. For the first time in two years the church bells in Britain were rung. Prior to that, they would have signaled a German invasion. In one of the strange fortunes of war Gott was killed flying back to Cairo for a bath on 7 August 1942 and Brooke, relieved, was finally able to persuade a reluctant Churchill to summon Montgomery later that night. Montgomery's peremptory assumption of command of Eighth Army was deeply resented by Auchinleck and his departing entourage, but became, for the men of Eighth Army, one of the miracles of the desert war. Seizing command two days earlier than authorized by Auchinleck (13 August 1942), ordering up immediate reinforcements from Cairo against Auchinleck's wishes, instructing the vital heights of Alam Halfa to be defended in strength, joining army and air headquarters together in a single operating unit, and instructing all contingency plans for retreat to be destroyed, Montgomery's edict that Eighth Army would stand and die where it stood told everything. ‘No Withdrawal and No Surrender’ became the army's buzzword, as the new, white-kneed, evangelical commander toured the units of his army, acquiring multiple cap badges for his Australian bush hat as he did, and spreading a new gospel of victory. 1. Your prime and main duty will be to take or destroy at the earliest opportunity the German-Italian army commanded by Field-Marshal Rommel, together with all its supplies and establishments in Egypt and Libya. 2. You will discharge or cause to be discharged such other duties as pertain to your command, without prejudice to the task described in paragraph 1, which must be considered paramount in His Majesty’s interests. Sir, The orders you gave me [on 10] August, 1942, have been fulfilled. His Majesty’s enemies, together with their impedimenta, have been completely eliminated from Egypt, Cyrenaica, Libya,**** and Tripolitania. I now await your further instructions. Occurring between 30 August and 6 September 1942, this was Rommel’s “last throw.” The “Desert Fox”, Rommel, knew that the British were building huge reserves of men tanks, stores and equipment for an offensive; and that if he was to conquer Egypt, he would have to get in first. He planned a typical Rommel manoeuvre: a huge “right hook” which would swing north behind the Eighth Army. His maps and intelligence told him that the British defenses at the southern end of the line were thin. Here is where he would attack. By night Rommel moved his units south, leaving dummy vehicles and trucks behind so as to fool the British. He wired his intentions to Rome and Berlin. His plans were in Montgomery’s and Alexander’s hands immediately. General Sir Francis de Guingand, Montgomery’s chief of staff, noticed on maps that the Ragil Depression, where Rommel was expected to strike, had deep, shifting and treacherous sands. Through the disinformation coming from the now British-controlled CONDOR spy system, a message was sent saying that the British in the south were awaiting reinforcements, and not ready for more than a makeshift defence. Then de Guingand had his cartographers make a map showing that the ground was hard and suitable for panzers. The problem was how to get the map to Rommel in such a way that he would believe it. A scout car loaded with explosives was sent towards the German lines with an already dead driver and detonated. The Germans sent a patrol to investigate and found the corpse, along with the false map. Rommel’s attack began on August 30th, and quickly bogged down in the newly-sown British minefields. Tanks, armoured cars, half-tracks, and trucks found themselves floundering in the “hard ground” on the false map, and were bombed and strafed by the RAF. Rommel ordered the attack to turn north, just as Montgomery had planned, and ran straight into the firepower of four armoured divisions where his intelligence had told him that there was only one. Rommel withdrew. Montgomery did not pursue him. His mind was focused on the coming major battle which would decide the entire North African campaign. In terms of men and material this battle, on 23 October 1942, was an unequal contest. The Eighth Army had about 195,000 men against Rommel’s 104,000, of whom only about 50,000 were German. In terms of equipment, the British preponderance in field guns was 1.6:1, in anti-tank guns 3:1, in tanks 2.7:1. What happened is well known. What is less well known is the deception employed by Montgomery, Operation Bertram, designed to deceive the enemy, minimize casualties and maximize success. As General de Guingand said to Col. Dudley Clarke, who masterminded the deception: “You must conceal 150,000 men, with 1000 guns and 1000 tanks, on a plain as flat and hard as a billiard table, and the Germans must know nothing about it, although they will be watching every movement, listening to every noise, and charting every track. Every bloody wog will be watching you and telling the Germans what you are doing for the price of a packet of tea. You cannot do it, of course, but you’ve bloody well got to.” Clarke and his team succeeded brilliantly. Montgomery planned his major attack in the north, so he had to convince Rommel that it was coming in the south. A dummy water pipeline was built to the south. A five-mile trench was laid with empty oil drums. At night, another five-mile trench was dug, the oil drums were moved into it, and the previous five-mile trench was filled in. The pace of construction was such that it would not reach the south at least forty-eight hours after the date of the major attack in the north. Dummy pumping stations were also built. At the southern end of the “pipeline” a nine square-mile patch of desert was transformed into a phony depot of about 9000 tons of ammunition, food and petrol, which was simulated by about 700 “stacks.” Telegraph poles were laid in gun pits to simulate artillery, with camouflage netting which was allowed to rot, so that the Germans would see they were dummies and take no notice of them. Then, just before Montgomery mounted an attack to justify all this activity, the telegraph poles were removed, and real guns were put in their place. Suddenly, guns the Germans believed to be dummies belched fire at them. It was a double bluff. In the north, multiple “sunshields” of phony ten-ton trucks large enough to hold a tank were constructed. To the Germans they appeared to be fixtures. Just before the attack, tanks were moved into the shelter of the dummy trucks which appeared not to have moved. Barrage guns, with their limbers and movers, were similarly in position to resemble three-ton trucks. That night over 900 guns opened up a fifteen minute barrage on the German lines in the north. The object was to punch a hole in the German lines, then exploit it with armour. On November 4th, Montgomery broke the Axis front, precipitating a general retreat, even though Hitler had ordered Rommel to stand firm. Shortly after the start of the attack, three events occurred which contributed to Rommel’s hopeless position. First, General Stumme, Rommel’s deputy during the latter’s absence in Germany, died of a heart attack. General Ritter Von Thoma, his successor, voluntarily surrendered and was invited to dinner by Montgomery. Second, German coast watchers reported the likelihood of a major British amphibious landing behind their lines. Behind a smokescreen there were noises and a smell of engines, the rattling of chains, voices of men shouting over loud-hailers, and flares. It was all a British sonic and naval ruse, provided by recordings aboard MTBs close to the beaches. Finally, Rommel’s fuel situation became desperate. He prevailed on Mussolini to send five tankers with urgently needed fuel for his tanks. GHQ Cairo knew about this from ULTRA intercepts, but the danger was that if all were sunk, particularly in foggy weather, Rommel would likely conclude that his secure communications were being compromised. The decision had to go all the way up to Churchill, who (despite the unfounded rumour that he failed to defend Coventry to protect his intelligence source in 1941) was quite willing to risk ULTRA if the stakes were high. In short order the tankers Proserpina, Tripolino, Ostia, Zara and Brioni were located from the air and sunk, one of them in Tobruk harbour. Sure enough, it was soon learned from ULTRA that Rommel suspected the security of his communications, if not Italian treachery. MI6 in Cairo then sent a message, in a code which they knew the Germans would be able to read, to a phantom group of agents in Naples congratulating them on their timely information, and offering them a raise in pay!